All SPEEDMIND Deluxe Pro Transmitter Bags have comfortable handles and all around zipper. Profiled to your radio shape interior foam helps cushion to fit specific radio maxmimizing protection of your valuable investment. 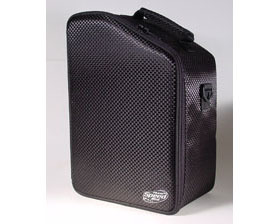 Padded sides and extra storage for other small gears. Excludive SPEEDMIND signature black graphite-look material that adds the PRO look to the bag. Designed for AIRTRONICS M11 transmitter.